A drawstring patchwork bag is an easy and pretty project to make, it won’t take long to finish it and it will become useful to keep in one place all your cosmetics! You will love to make one for you and you might want to make a couple more of this bag to have them ready for the Holidays to give them as a present. You might have already an orphan patchwork at home and you might want to use it to make this drawstring bag, or you can follow my tutorial to make one with a Dresden plate pattern. I’m sure you might have already all the materials you need to make it at home. 2 circles of fabric of 13.5″ in two different cotton 100 % fabric. Download and print the pattern here, cut out the templates. 8 pieces of fabric in 4 different cotton fabric, you will need to cut two pieces from each fabric. 1 piece of shoe lace of 1 m long. Cut all the pieces for the Dresden Plate and for the bag. Place four pieces of fabric to make the Dresden plate on your work table to display the fabrics the way you will sew them, you need to make two halves first. Place the first piece on top of the second and sew one side, open and press, place the third piece of fabric and sew one side, open and press, place the fourth piece over the third piece and sew, open and press, do the same with the other four pieces to make the second half. Once you have the two halves made, place one half over the other half, place some pins to hold the two pieces together while you sew them on the sewing machine. Open and press. 2. Take the fabric circle to make the bag, and fold it in half, fold it again and mark the center. Open the fabric circle and place the Dresden plate on it, place a few pins to hold the Dresden plate in its place while you do the applique. 3. 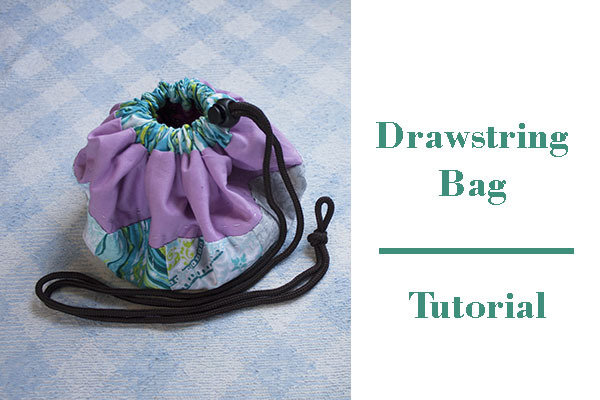 Cut the fabric for the drawstring and fold the two ends and sew them with your sewing machine. If you don’t have a piece of fabric as long as you need this piece of fabric, you always can cut two or three pieces of fabric and sew them together to make this piece of fabric as long as you need it. Fold this piece of fabric and press. 4. Place this piece of fabric all around the circle, place as many pins as you need to keep it on its place. You can make running stitches and remove the pins, by doing that, it will be easier for you to handle this piece while you work with it. Place the circle of fabric for the inside of the back on top of this piece, and place as many pins as you need to hold the two pieces together while you sew them together with your sewing machine. Sew all around and don’t forget to leave a space open to turn it out. 5. Once you finish sewing this piece with your sewing machine, trim it with your scissors, and make a little cut in the fabric, do not cut the sewing. You can turn it out. 6. Place some safety pins on your bag and do some quilting, I did it by hand but you can decide whether to do it by hand or by machine. 7. Once the quilting is finished, you can get the shoes lace in the piece of fabric for it, it will be easier if you place one safety pin in one end of the shoes lace. 8. Place the two ends side by side and make a few stitches to hold both ends, this way you don’t need to make a knot to keep them together. Getting to this point where you sew the two ends together inside the fabric. 9. Place the spring plastic cord lock, pull out the cord and your bag is ready!! It didn’t take long to make it and it looks nice!! I’m sure you’ll be making one for you and a few of them to get them ready to give them as a present during the Holidays or on a Birthday! If you make it, let me know, you can share a photo of your bag in my Facebook Page Alejandra’s Quilt Studio in a comment, I’m sure it will get many LIKES and comments! If you haven’t following me yet on my YouTube channel, you can follow me anytime, this way you’ll be the first one to watch my new videos!! I thank you for your visit to my blog!! Now be awesome and share this post! !